PERSIMMONS. I better hurry up and pick them before the frost makes them burst. Every autumn it’s the same story. We first have a brief spell of leaf glory, when the proverbial Umbrian green turns to golden and red. Then rain comes, more rain than we want. Everything becomes gray except the persimmons. You see them whimsically dotting orchards and gardens with their naked orangeness. 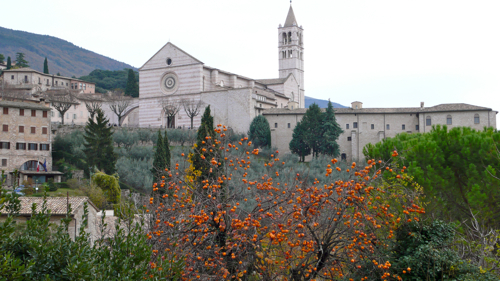 The Umbrian fall is too cold to ripen them on the tree. We pick them and put them in plastic bags together with an apple or two. Apples release ethylene, a ripening plant-hormone. After a few days they are soft and can be eaten fresh or preserved. It’s a very delicate fruit whose flavor boils easily away. This recipe is the result of several experiments, it’s Christmassy, aromatic and comforting. It even pleases people who don’t like persimmons, like my friend Rebecca. She has admitted to have polished a whole jar before her kids returned from school so to avoid competition. Pectin products vary from place to place. Buy your favorite pectin and use it according to package instructions. You can also make the jam without pectin, by boiling it slowly until thick. In this case but make sure to add the spices and orange juice at the end to preserve their flavor. Halve and juice the oranges. Reserve the juice. Put peels in a large pot and cover with cold water. Bring to a boil and cook for 3 minutes. Drain. Return peels to pot, cover with cold water, bring to a boil, cook 3 minutes, and drain. Repeat once more if you have thick skinned oranges. Strain and leave them in a colander until cool enough to handle, 20 minutes. Using a soup spoon, scrape out the membranes and discard. Cut the peels into thin strips. Clean, peel and chop persimmons. Make sure to peel them completely because the peel becomes like hard leather once cooked. Add the orange juice, spices and chopped peel to the cleaned and chopped persimmons. Add pectin and sugar following package instructions. Boil and transfer into sterilized jars. Seal. What lovely photos, I can almost smell this jam cooking! Ciao Sandra, just remind me, you can taste it next time you are here! I can’t wait to try this! A question…. What is China 5 spice? Or rather, what spices that are commonly in the Italian kitchen can be used in its place? China 5 spices is commonly used in Chinese cuisine and contains ground star anise, cloves, cinnamon, Sichuan pepper and fennel seeds. You can find it in Chinese stores, but you can substitute it with 1/5 of a teaspoon of the individual spices. When I do this I omit the pepper and add some cardamom. These spices are not comon to Italian cuisine, but yu need a strong spice mixture to enhance the flavor of this jam, this is really what makes the recipe. I hope you will try it! I made this wonderful jam with FuYu persimmons (which we are fortuante to grow – we love persimmons and so do our deer). I used Navel oranges, rather than juice oranges because I wanted both the sweeter juice and the very fragrant and oily skin for the required slivers. I actually used 5 lbs of fruit, which worked out well because, once each fruit is peeled and the cap removed, I ended up with about 4 lbs – 2 oz of recipe-ready persimmons. The only modification I made was to reduce 1/3 cup of Gran Marnier to 1/4 cup of syrup and add that to the orange juice, spice and orange slivers. I do not regret the addition of the Gran Marnier syrup. I also added a cup of water to the fruit in the pot to keep it from scorching or caramelizing as it started to break down. I cut each juiced and triple-boiled orange half into quarters, giving me a pile of triangles. I found that using a very sharp paring knife, rather than a spoon, to remove the orange pulp and to take the inside of the peel right down to the very thinnest clean rind worked extremely well – the rind should be almost as orange on it’s inside as it is on the outside. Then I cut the slivers to the finest julienne possible, each no longer than 1 inch. I did use only one measure of natural pectin and cooked the fruit slowly over a medium-low heat, stirring occasionally to prevent any burning and to reduce and thicken the jam. It set up very well. I got about 7 pints from this recipe, enough to last me until the 2011 harvest. I will be trying this aromatic and complex jam on roast pork tenderloin as a glaze. I would also suggest using it in baked items, like kolachkys or even a drop on a butter cookie. Butter really works well with this jam. Well buttered scones or English muffins really pair up wonderfully. If you are a fan of true orange marmelade made from the Seville orange, you will love this recipe. Tantissime grazie, Chef Letizia! Just made a small batch and I am afraid it may disappear due to it’s unbelievable flavor! Thanks for telling me why not to use the persimmon peel! wonderful, I m glad you enjoy it! Have you ever made this with Hachiya persimmons? Or just the sweet Fuyus? I just made a big batch (not this recipe) with hachiyas, thinking the bitterness of the not-completely-ripe fruit would cook away…it didn’t. Had to throw the whole thing out. So, I’m wondering what kind of persimmons you used for this recipe. Thank you! Hi Mara, what a pity for the work! I have an old tree and I am not sure which variety it is. However persimmon must always be ripened before using otherwise they are useless. To do it relatively quickly put 10 persimmon or so in a plastic bag with one apple. They will be ripe and sweet in a few days. Then peel them completely, then use. Even if ripe, the peel becomes hard and inedible after cooking. They are difficutl things to use but I can guarantee you that with the proper care this jam is fantastic. It has taken me quite some expriments to get to a nice recipe, lots of stuff has gone unused (or in the bin) in the past! Thank you for this great recipe! We have a persimmon tree in our back yard, my husband has been nursing it back to health for 5 years. This year it is full of persimmons. I had always had negative thoughts about persimmons because my mom always talks about the unripe persimmon she ate once! I hated for all of my husbands hard work to go to waste so my daughter and I just made a small batch of jam using your recipe. She was scraping the pot after we filled the jars! It is the best jam I have ever tasted! Thank you for the tip on ripening the persimmons. Regarding the peel, I used some of mine because I needed a few that weren’t very ripe to make the recipe and the peel was fine. I used my Vitamix to puree most of it, I think we have a Fuyu persimmon which may be why the peel is not bitter. Once again thank you!!! Hi Tiffany, thank you for the lovely comments! Enjoy the jam it gets better with a little rest and it also makes a great crostata, a traditional and delicious short bread pastry tart from Umbria. “1.6 kg (3.5 lb) sugar”. Really, you couldn’t use the measurements that 98% of the rest of us use? CUPS! I have no idea how many cups make 1.6 kg of sugar. Hi Marshall, thak you so much for yoru comment. I am Italian, I live in Italy. In the whole of Europe we use the metric system. My blog is followed by people who lives in all continents and most often they use the metric system. You can hardly buy measuring cups in a shop here. I do my best to make recipes available for others but it’s may be time for people to realize that there’s something else outside their borders. Scales are cheaply available in your country as far as I know. Wheighing your ingredients would make your cooking more accurate and relaiable as every professional cooks knows. You can also Google “convert cups to lb” or similar sentences. We have a tree of the older, astringent variety of persimmons, and here, in Auckland, New Zealand, the weather is warm enough to ripen them, although we have to pick them when orange and firm or else the birds would eat them all. I made this jam using ripe persimmons and it is lovely. 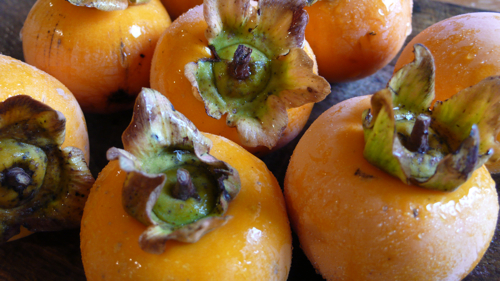 I have some frozen persimmon pulp that I am going to try the recipe with too. I think it should work well. I’m glad I discovered your blog! Hi Susan, I am glad you liked it. This jam has costed me a lot of experiments. Perismmon is very delicate and does not make a good jam by itself, but teh orange and spices bring out its flavor. Try it on a tart! Letizia, I apologize for my co-national Marshall Baxter. Your reply was quite correct: anyone can find conversion sites on the Internet. Over the years I have been asked to convert many American recipes for my Umbrian friends from volumes (cups and spoons) to metric weights. It appears that measuring cups and spoons are more easily available in Umbria now, but as you so justly say most of the world doesn’t use the American system and Americans, who travel outside the US much less frequently than it might seem judging by all those American tourists you see around, are often amazed to discover that other people do things “differently”. So much for the mind-broadening effects of travel…. Now if I could just figure out where to find China 5 spices here in Umbria!